Hello, I'm Gregor and I put this site together. At first, you'll find an overview of recommended bike racks for cars, followed by a public poll and a general buying guide on bike racks for car. 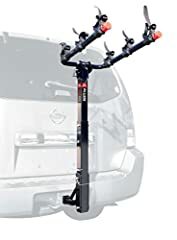 Further down on this page, we do link to other well-written articles and reviews about bike racks for cars. At last, you'll be able to weight in your own opinion in the comments section. If you also want to vote on the best bike racks for car, click here to view the poll. If you are an avid cyclist or even just someone who enjoys taking an occasional sight-seeing tour on your bicycle, you will likely need to take your bicycle with you to ride it where you want. To transport your bicycle, having a bicycle rack is essential. there are several different styles of bicycle racks from which to choose, making it important for you to understand which style might be the best for you. To choose a bicycle rack, you should start by asking yourself how often you need to transport your bikes. It is also important for you to consider how many bikes you will need to transport and their types. The weight of the bicycles is also a factor as well as if they have through-axles. 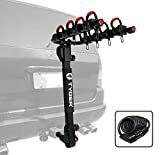 Other important considerations are whether your car has a receiver hitch and where you would like to carry your bicycles. Finally, you'll want to think about if you want a rack that can carry other types of equipment in addition to your bicycle. There are many different bicycles that vary greatly in cost, weight and size, which should also factor into how you choose to carry them. For example, you likely wouldn't want to risk carrying a very expensive bicycle on a low-end rack that could potentially fail. You should also think about whether the rack will continue to work for you both now and later. You'll want one that is practical and easy to fit to both your vehicle and the load that it will carry. Finally, you'll want to choose a bicycle rack that is secure and that locks your bicycles and locks to your vehicle. There are three primary types of bicycle racks, including hitch-mounted, roof-mounted and trunk-mounted racks. There are also specialty racks that can meet unique needs. Here is what you need to know about each type. 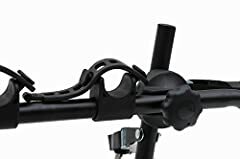 To use a hitch-mounted bicycle rack, your vehicle must have a receiver hitch that is either 1 1/4 inch or 2 inches mounted to it. Hitch-mounted bicycle racks are easier to use for loading and unloading your bicycles. They are also good choices because you won't have to lift your bicycles on top of the roof. However, they tend to be more expensive than the other styles of bicycle racks. Most hitch-mounted racks lock the rack and the bicycle to your car. 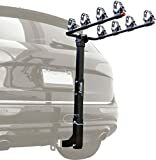 They may have designs that have hinged sections that allow you to access the trunk or tailgate of your car or truck without having to unload your bicycles. 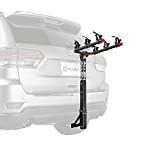 If you opt to purchase a hitch-mounted rack that has multiple features such as repair stands, built-in locks, and lightweight materials, you should expect to pay more. If you do not already have a hitch installed on your vehicle, you will also need to get one. Some cars can only have hitches that are 1 1/4 inches, which will limit you to carrying two bikes instead of more. 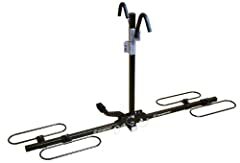 When you carry your bicycles on a hitch-mounted rack, it will normally either hold the bicycles by hanging from their top tires or by their wheels with an arm that secures to the front wheel. The advantages of hitch-mounted racks are that the higher-end racks are sturdy. Since they do not impede the airflow from the front of the car, they will not have a significant impact on your vehicle's fuel consumption. The security can be excellent, and it is easy to load and unload your bicycles. 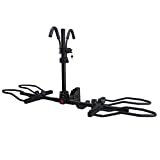 A disadvantage of a hitch-mounted rack is that you will need to have a receiver hitch. If you do not already have one, it will be an added expense. 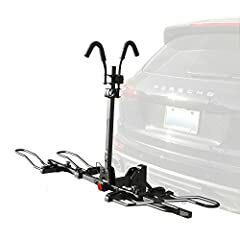 Finally, backing up your vehicle with the bicycles unloaded will take some care so that you don't forget about the rack and back into someone else with it. Roof racks are mounted to the top of your vehicle's roof and have cross bars for you to attach the accessories. 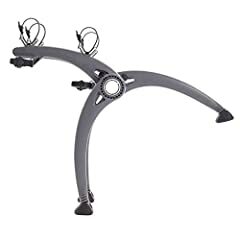 Some bicycle roof racks will require you to remove the front wheel of your bicycle while others won't require you to remove the wheel. Removing the front wheel helps to keep the bicycle lower and can make the bicycle lighter to load. It is the most common way that people transport their bicycles on top of their vehicles. Roof-mounted racks that allow you to keep both wheels on your bike are normally more expensive and can be less stable. Either type of roof-mounted bicycle rack will likely use an integrated lock to lock the bicycle to the rack. The rack itself will be locked to the crossbars, which will be locked to your vehicle. There are some simple roof-mounted racks that don't require you to use the base bar set up. 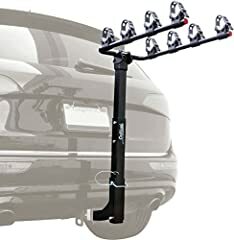 These might have suction cups that attach to your car or racks that attach to the factory roof rack that came with your vehicle. Most people keep their roof racks on their vehicles all of the time because of their versatility. In addition to carrying your bicycles, you can also use your roof-mounted rack to carry other items such as boxes, skis, canoes or kayaks. People also use them to carry other bulky items such as ladders and others. The versatility of roof-mounted racks is a major advantage. They are also very secure and don't prevent you from being able to get into your trunk or tailgate. However, if you drive under a low overhang and forget about your bicycles, you could damage all of them. Having bicycles on top of your vehicle will also increase the drag and drive up your fuel consumption. 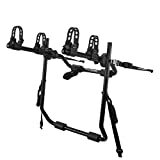 The cheapest type of bicycle rack available is the trunk-mounted rack. These racks also tend to be the least secure. The racks are secured to your car with straps that attach around the lip of your car's bumper or trunk. Trunk-mounted racks are adjusable so that they can be fitted to nearly any type of vehicle. They use foam or rubber feet to grip your vehicle. While these racks are affordable, they must be fitted properly. The hooks that are used to hold the straps to your car can also damage the vehicle's paint. 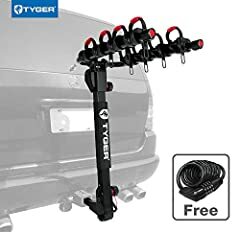 The cheapest trunk racks normally will not provide you with a way to lock the rack to your vehicle or to lock your bicycle, which can make it easy for a thief to steal your bike. The advantages of a trunk-mounted bicycle rack are the affordability and the ease of removal. The racks fold easily and are small so that they can be stored. However, they are not very secure. If you do not fit it correctly, you might lose all of your bicycles while you are driving. Finally, the racks might make it easy for thieves who want to steal your bicycles. There are companies that make specialty bicycle racks that can fit almost any vehicle. These might work for SUVs that have rear-attached spare tires and pickup truck beds. Specialty bicycle racks make it convenient and safe for you to transport your bicycle. Examples include tailgate pads on pickup trucks or loop and hook tie downs to keep your bicycles secure. Transporting your bicycles in a safe and secure manner is important. If you love to ride your bicycle and need to take it with you sometimes, choosing a good bicycle rack is important. You will want to consider your needs and the rack style that suits you the best so that you find the bicycle rack that works the best for you. New: Our editorial list of additional articles. 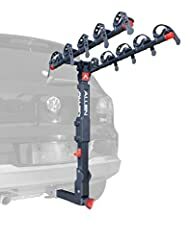 We decided to gather informartion all around the internet and present you a list of helpful, external links to interesting reads about the best bike racks for cars and their reviews and guides. You're not convinced by the previous writings about bike racks for cars? Of course you can just choose by visual impression, that's why we present you all our chosen products at a single glance. A click on any image is enough to open an external link to the best offer we could find. Northrock Bikes Presents - A closer look at the ways you can transport your bike using various styles of vehicle bike rack systems. Which one is right for you? Finally, we want to present you our rating criteria for our bike racks for car comparison, so you can better understand and comprehend our recommendations and the rating process itself. 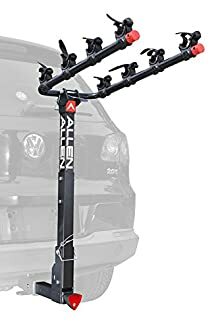 Furthermore, we still ask you to keep your eyes open for short term deals in order to make some great bargains with bike racks for car in 2019. Published by G. Krambs on StrawPoll.com (last update on 2019-04-23 08:03:40).